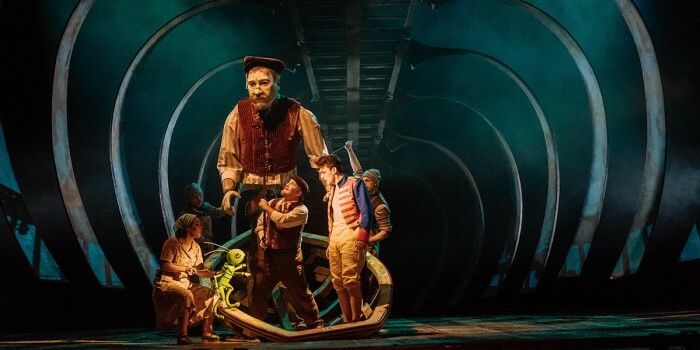 No word of a lie: there’s something magical happening right now at the National Theatre, where a new musical adaptation of Pinocchio is making its world premiere on the Lyttelton Theatre stage. And with a sensational creative team including director John Tiffany (Harry Potter And The Cursed Child) and writer Dennis Kelly (Matilda The Musical) translating the wonder of Walt Disney’s ethereal world to the stage, it’s not just the titular wooden puppet that’s bursting with life and love. Here are our top five reasons why you should catch Pinocchio. From the peaceful alpine forest to the raucous Pleasure Island, and from the bright lights of the circus to the murky depths of the ocean, Pinocchio is a show with remarkable scope. Bringing together elements of both the film and the original 1883 Carlo Collodi story – leaning perhaps more heavily on the latter – the show is thrilling from start to finish. Kelly’s book hums with humour and beautifully glues together the show’s spectacular set pieces, and while there’s a darkly gothic vibe throughout – I’d agree with the show’s age recommendation of brave eight year-olds and up – it’s a real adventure which holds something for everyone. There’s even a heartwarming message about pain and love – just in time for Christmas. From the opening bars of music (Disney fans will be able to guess the song – and probably the exact phrase in question! ), it’s quite clear that Pinocchio is set to be a special experience for all in tow. Leigh Harline, Ned Washington and Paul J. Smith’s songs and score from the Walt Disney film are adapted beautifully by Martin Lowe, complimenting the on-stage action with bountiful, toe-tapping spirit. Tunes which underpinned the original film such as I’ve Got No Strings have been deftly extended into full-length production numbers, while I defy anyone not to smile when Jiminy Cricket teaches us all to Give A Little Whistle. Just try to hold it together in the show’s final When You Wish Upon A Star hits home. Wow. 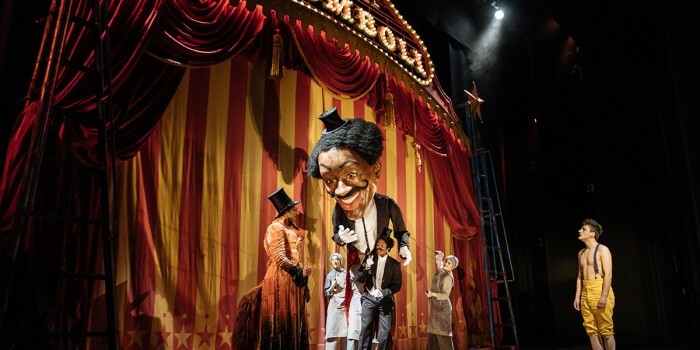 There are more world-class creatives behind Pinocchio than you can shake a wooden nose at, and illusionist Jamie Harrison’s slick tricks feature prominently among them, having already stunned the West End with his work in Harry Potter And The Cursed Child. It’s a huge credit to Harrison and his charges – and a huge sore to your oft-being-scratched head – that he manages to stage nose-extending, knife-throwing and fish-gobbling, amongst other things, so ingeniously and seemingly naturally. And while you’re aware it’s all sleight of hand, it’s pulled off so quickly you’ll be rubbing your eyes in disbelief on plenty of occasions. While there are many well-crafted elements in Pinocchio, it was the phenomenal puppetry that will linger longest in my mind. Every adult human in the show is replaced with a “giant” puppet, operated by a team of puppeteers including the character’s voice actor; it’s a brilliant way of showing the looming world from Pinocchio’s small size, and is quite wonderful. 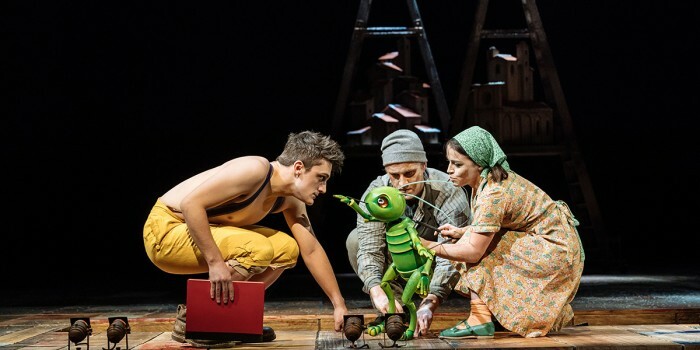 Meanwhile, there’s a standout physical performance from Audrey Brisson (accompanied by James Charlton) as a mild-mannered but quippy Jiminy Cricket, and Mark Hadfield is a touching puppet-maker Geppetto. Pinocchio is an ambitious choice of story for sure, but this production will frequently surpass your expectations of what can be achieved on stage. 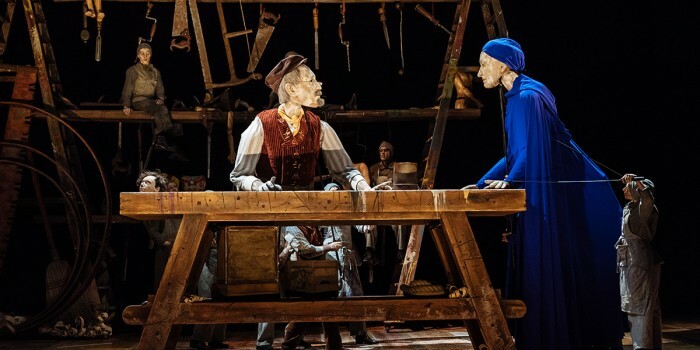 Strange, surreal, and positively stuffed with wonder; with no bounds on its imagination tying it down, the National Theatre’s Pinocchio will spring straight into your heart. 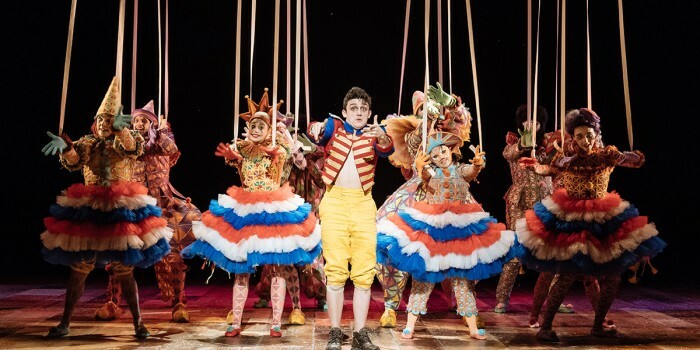 Pinocchio plays at the National Theatre until Tuesday 10 April 2018. You can book your tickets via the National Theatre website.